Recently, many of the products churned out by the giants of game development are very serious, with most of the big name games being dreary, dark, psychologically exhausting adventures. Often the protagonist is forced to fight through bleak and hopeless situations, and the setting is almost certainly a baron, apocalyptic wasteland inhabited by more zombies than even George A. Romano could cope with. It’s almost as if Netflix is broken, and now we are only allowed to browse the psychological-thriller-with-a-strong-female-protagonist genre. Whilst such dystopian duplicates dominate the triple-A market, there are a few light-hearted alternatives heading the indie revolution. Alongside some recent simulators (some good, some admittedly dreadful) for example the octopus-simulated madness of Octodad, one of the best games of the movement is undoubtedly Jazzpunk. 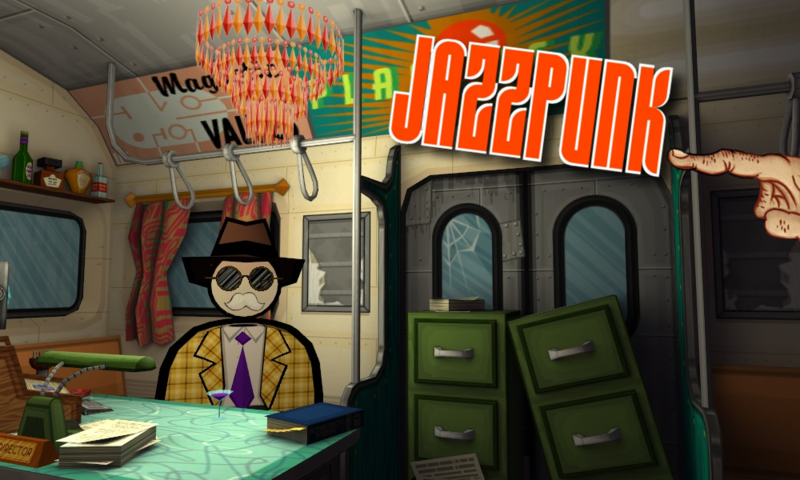 Made by Necrophone Games and published by Adult Swim, Jazzpunk is a surreal faux espionage comedy adventure in which you play as Polyblank, perhaps the most unremarkable lead protagonist of any game. Jazzpunk begins with a Catch Me If You Can style opening sequence where we follow a suspicious human shaped suitcase though the conveyor belts of baggage reclaim. We are eventually dropped off at Darlington Station where we meet our boss ‘The Director’, who then sends us on some weird, prescription medicine induced missions. And that is where I’m going to stop talking about the game, because Jazzpunk begs to be played. Just as a joke is more about the teller than the punchline, in order to fully appreciate the humour of Jazzpunk you have to play it; the game would be nowhere near as funny if you simply read what the game is about. Jazzpunk is visually fantastic. It has a distinctive style, which is often the key to the success of an indie game. Despite its individuality, Jazzpunk clearly has many influences; perhaps most notably the 1950s American noir inspired story and characters. The cartoonishness of the game’s slap stick comedy as well as its artwork distances Jazzpunk from other recent games and keeps the tone humorous. The comedy really is the main selling point here. The game is simultaneously nostalgic and futuristic, packed with clever pop culture references and absurd jokes. The abundance of sight gags and characters who are authoritative yet hilariously incompetent ensures comparisons to Police Squad! or indeed any one of the Leslie Nielsen spoofs. However, the sheer nonsensical childishness of Jazzpunk resembles old fashioned British surrealist comedy so strongly that comparisons to Monty Python would not be unwarranted. One downside of Jazzpunk is that the gameplay does get a tad repetitive, and this is because you’re not really playing a game in the traditional sense. It could be argued that this is more of an interactive story similar to Gone Home or Dear Esther. There is some ingenuity in the interaction, which is always incredibly exciting the first time it happens, but eventually the tedium of the actions will set in. The controls themselves are very basic but do feel a bit loose and it can be hard to control; it’s a bit slip-and-slidey, so when precision is required it can be a bit difficult. Jazzpunk suffers from the same inaccuracy of controls as Half-Life, whereby imprecision of the controls made laborious jumping puzzles almost impossible. This frictionless experience adds to another issue with the game in that it can cause motion sickness. We’ve seen this before in The Stanley Parable and Anti-Chamber, and although it doesn’t affect everyone, it does ruin the enjoyment if you are permanently semi-nauseated. Here is the main sticking point with Jazzpunk: It’s £11 and that’s only for 3 hours of gameplay. Yes, there is a lot to do and a lot to see, and in each level you can look around every nook and cranny finding things so intensely cool that you’ll wonder why it wasn’t the main focus of the game. A plethora of achievements are available to strive for, and you really need to explore the levels thoroughly to complete them. Jazzpunk also boasts mini games in which you can attack anthropomorphic pizzas or perform 360 noscopes on unsuspecting NPC noobs. However, there is no real replayability. You are paying £11 for three hours, meaning every hour of gameplay costs you £4. It is currently the same price as Battleblock Theatre which has a much longer main story, an online mode, a co-op mode and many downloadable maps in the Steam Workshop. Jazzpunk is not a demanding game on your system though, and thus should run pretty well on even low-end computers. The settings menu isn’t particularly inspiring, but you can change the quality through some pre-sets if your computer is struggling; as the owner of a potato I can confirm the game runs reasonably well on low end systems, as long as there aren’t any mass particle effects happening. 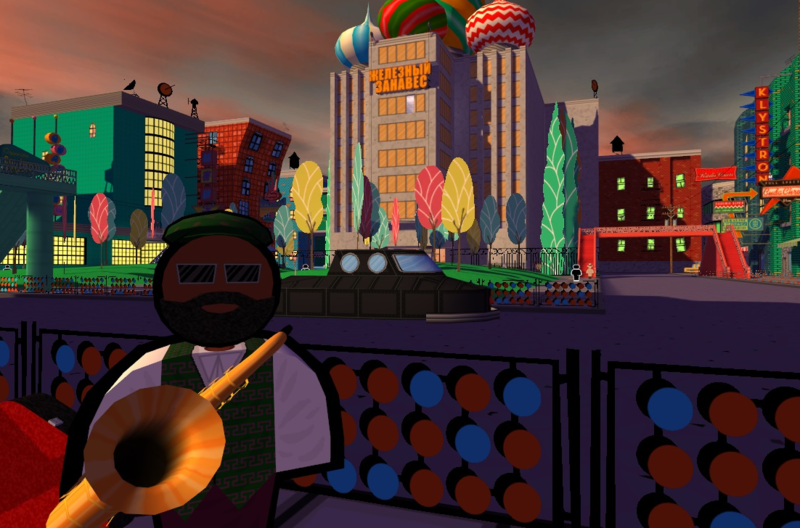 Jazzpunk is an incredibly fun game that begs you to play it, to explore everything it’s got. The more you look around, the more entertaining and amusing it is, though you’ve got to want to look around. You are not going to enjoy your £4 an hour experience just trotting through the objectives and then never touching it again. At £11 it’s going to be hard to justify, but if it’s ever on sale you won’t want to miss it.